Men's heeled boots come in a variety of styles. High heel boots for men are more popular than ever before. Not only are they extremely comfortable and supportive, but they add an entirely new look to casual jeans and dress pants. There are more options than you might have first thought, so why not explore high heel boots? You are interested in the world of men's high-heeled boots, but you don't know where to start. Try these looks on for size, and you certainly won't regret it. Cowboy Boots: Cowboy boots might not be the first high heel boots for men that you think of, but they are definitely the most popular. Cowboy boots are hard-wearing and come in a variety of colorways, so you can experiment with styles that match with your personal taste. Consider pairs with hand-tooled accents along the side in self colors, wooden soles, and ones with a touch of daring color along the shaft. 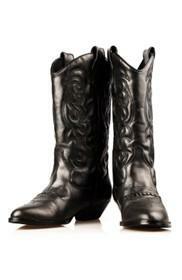 Equestrian-Inspired Boots: Still into the cowboy theme? Look for something slightly more sophisticated with a men's riding boot. You can find lace-up boots with slim and loose-fit shafts that complement both your silhouette and style. If you are into military styles, then you might want to look into wearing equestrian-inspired boots with the top of army fatigue or khaki-colored jeans tucked in. Frye Boots: These traditional men's heeled boots will never go out of style, and for good reason. These boots often feature an exciting upper material that begs to be paired with knits, soft denim and khaki, and heavy utilitarian fabrics. These boots can last a lifetime, and why wouldn't you want them to? Frye Boots are a working person's essential, and a fashionable man's must-buy. Heels are slightly higher than other men's boots. Beatle Boots: Beatle boots are here to stay! Grab leather boots styled like the Beatles' boots to make your feet look extra-slim and long-- and also to boost your height. These boots are essentially European in design, so if you have trouble finding them in North America, simply do some shopping across the pond via the e-commerce links below.Beatle boots are always crafted in a high-gloss leather, which makes them look more formal and expensive than other pairs of men's high-heeled boots. Army Boots: If you take a look at army or combat boots, you will notice that they feature a bit of a heel. This is a great way to add an authoritative vibe to your outfit, and you will also find that these boots last forever. While the standard military-issue boots for men will last the longest and look the most authentic, you can also find boots that are inspired by the military standard-issue types. Get high-quality men's heeled boots at these select locations. Shop at John Varvatos for a great selection of distressed-style boots. You can find a number of worn-out style boots with chunkier heels at the website, and price points are high, but easily justified. For the more fashionable man with an interest in quality goods. Pick up more utilitarian styles at Urban Outfitters, which offers a number of boots for men in designs like cowboy and military-inspired. You will particularly like the lace-up versions they have, with a slight heel that's more functional than fashionable. Shop for men's cowboy boots at Endless.com, which offers a variety of shapely, interesting boots for the guy who likes old-fashioned heeled options. Tooled versions with wooden heels can be obtained at varying price points, so it's worth shopping around the site first. Go to Dillard's to get Dr. Martens at an affordable price. These for-men boots are often offered with a relatively low heel. Since men's boots are more varied than you'd expect, you might want to slide some on to test the fit today.